What is GHS (Global Harmonized System) Training? Around the world chemical packaging is printed with identifying symbols, wording, and instructions. People of all ages, economies, cultures and languages, are all in contact with various chemical products and hazardous materials every day. Discrepancies and misunderstanding can happen between systems of communication and different systems can exist not only between countries, but sometimes even within the same country. This creates an environment at high risk for miscommunication surrounding chemicals, raising the possibility for accidents, injury, and health-related dangers due to exposure. Given the level of danger, it was introduced that a standardized system of communication surrounding hazardous products and materials benefits everyone, the public and especially those who work closely with chemicals. In 2002, an international team of hazard communication experts developed the first version of the Globally Harmonized System of Classification and Labelling of Chemicals (GHS) through the United Nations. The GHS makes it much easier to handle chemical products by identifying three major groups of hazards: Physical hazards, health hazards, and environmental hazards. Overall, GHS has two major focuses: providing criteria for the classification of chemicals and providing communication of the hazards of chemicals. The standards encompass labelling, including symbols and informational wording, for hazardous product containers and packaging, as well as uniform formatting for the printing of these labels and instructions. Care is taken to select both wording and formatting that is clear and easy to read to avoid any chance of misunderstanding. Symbols are used in labelling to communicate quickly without relying on language. Datasheets were developed to deliver the best information on a chemical product regarding its safety in storage, in transport, and also in case of emergencies. Applying a uniform communication system benefits trade between companies and across various fields of work. It improves costs and efficiency for companies to label hazardous materials in a similar manner for sorting, storage and shipping. Lastly, in the case of chemical emergencies, it is a lot easier to secure help in a timely manner, saving both lives and money. To ensure best and most current practices are followed, the GHS has been revised many times, most recently in 2015. In Canada, the GHS is implemented by informing a Workplace Hazardous Materials Information System (WHMIS) and a multi-year transitional plan to upgrade from WHMIS 1988 to WHMIS 2015 has just been completed as of May 31, 2018. Over 65 countries today adhere to the GHS. It is not a law; it is voluntarily applied and regulated through each country or individual company. Different parts of the GHS can be selected and enacted at the discretion of each company or country. In Canada, only the parts of the GHS that have been chosen by Canadian legislation for Canadian companies to adhere to can be enforced. Despite being non-binding, since its introduction and voluntary application, worker and public safety, as well as ease and profitability of trade, have been significantly improved around the world. 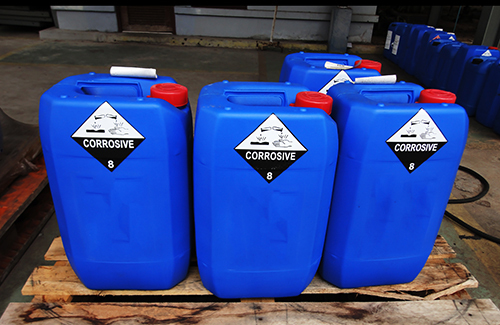 It can be asserted that chemical injuries and incidents ranging from minor to major have undoubtedly been avoided. It takes many people to accept responsibility for handling chemicals properly, across all levels of the public, employees, corporations, and government. Producers and suppliers, employers and employees alike must participate in WHMIS 2015 (which includes the elements of GHS adopted by Canadian legislation). Producers should classify hazardous materials, preparing labels accurately. Employers and employees must ensure they are educated about the products they transport or use, provide and/or participate in WHMIS 2015 training, and ultimately do their best to protect themselves and the public. Home / Articles & Resources / What is GHS Global Harmonized System?